German brotzeitteller is a tasty snack that means "bread time"
I frequent my local German brewpub, Bayern Brewing’s Edelweiss Bistro, and I’m almost ashamed to say I always order the same thing: a pilsner and the brotzeitteller. There’s other great stuff on the menu—a killer brat, obviously, and an addictive, cold cheese dip called obatzda—but I generally overlook them because I’m addicted to the brotzeitteller. 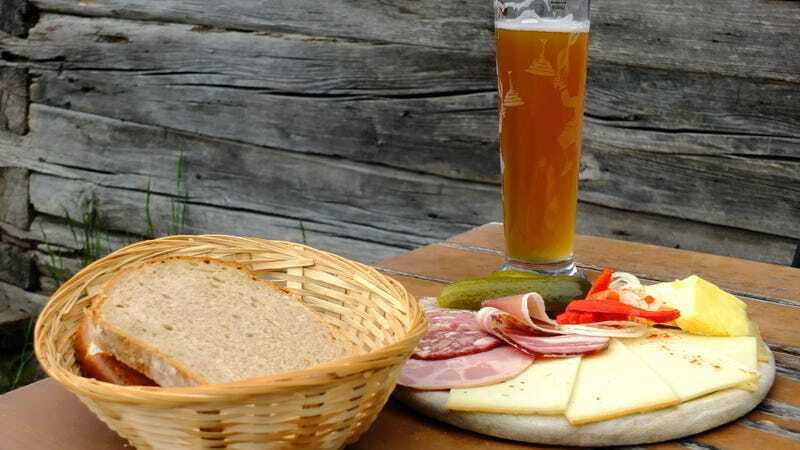 Bayern serves it as a wooden board laden with deli meats, cheeses, mustard, radishes, proper pickles, and heaped high with rustic, brown bread. I always figured brotzeitteller was just a German word for charcuterie, but no, its English equivalent way more charming: bread-time plate. I finally learned this via—what else—Google, which led me down a bread-time rabbit hole. I found blogs from Germans and German ex-pats extolling the virtues of the simple ritual of brotzeit, a little snack that is not to be confused with abendbrot, literally “evening bread,” which is an informal bread-and-sausage meal consumed in the evening, after you’ve eaten the day’s main meal in the afternoon. The addition of the -teller suffix means plate, and indicates a full spread of breads and meats and cheese and accoutrements, versus a mini brotzeit snack like a small sandwich. Brotzeitteller is simple, as all the best foods are, but that means each component must be of the utmost quality and Bavarian-ness. At Bayern, founder Jurgen Knoller will settle for no less than delicious Löwensenf-brand brown mustard from Germany; precisely the right type of tiny, briny pickles, cornichon-like in shape; and of course, the hearty but not tough rye bread. I like to assemble tea-sandwich-sized stacks of bread, German salami, and creamy white cheese, slathered just-right with spicy mustard and butter and topped with a crunchy radish. It hits so many flavor and texture notes, and most importantly, it’s killer with an unfiltered German pilsner. Sorry, pretzels and brats, you’ll have to wait on me again. I’m on bread time.